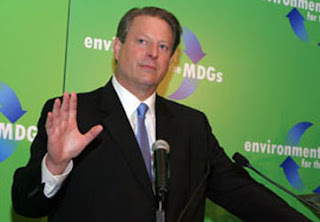 Now the kooks at PETA want a piece of Al Gore too. See here. Basically they’re saying Al’s a hypocrite because he still eats meat, despite the fact that “animals raised for food generate more greenhouse gases than all cars and trucks combined.” They also say that “switching to a vegan diet is more effective in countering global warming than switching from a standard American car to a Prius.” Well, I’m glad to know that I’ve been doing my part to help the planet since the 1970s. Question: Do you think Al will change his Bambi-eating ways? I doubt it. I’ve seen the way he tears into a steak. Nope, old Al will just carry on, flying around the world in private jets, tooling around in armored SUVs, using ten times more electricity at his non-solar-powered house than the average American, eating animals and telling the rest of us that we need to change. Second question: How long till the frigtards at Greenpeace find a way to take a chunk out of Al too? They’re usually hot on the heels of anything that will get them some publicity.